The history surrounding gold is centuries old. Gold coins were first struck on the order of King Croesus of Lydia, an area that is part of Turkey today. Gold coins were used long before paper money was ever introduced as a medium of exchange. By the late 19th century, many currencies around the globe were attached to gold, or fixed at a set price per ounce. That is known as the Gold Standard. Let's take a quick look at the fascinating history and future of the gold standard. In 1971, the U.S. went off the gold standard under President Nixon. What many gold investors don't know is that the classic gold standard that the U.S. was using included a 40% cover ratio. What does that mean? The 40% cover ratio meant the U.S. government would only print money if it has gold in its Treasury equal to 40% of the currency in circulation. For example, if the U.S. had $10 billion of money in circulation, the 40% cover ratio meant the government had $4 billion of gold in the Treasury. With the current U.S. debt totaling $21 trillion, even though the U.S. has the most gold in the world, we don't have enough gold in Fort Knox to pay off our debts. That means a return to the gold standard is unlikely, or it would mean the government would need to "revalue" the price of gold about 400-500% higher than the current $1,350 an ounce. Economists say a return to the gold standard would choke off economic growth. Modern finance includes the concept of a "growing money supply." The Federal Reserve can flip the switch and print more dollars, just like the "quantitative easing" efforts that were seen in the wake of the 2008 Global Financial Crisis. You can't print more gold. Money supply couldn't grow faster than the supply of gold, which could force lending and economic growth to slow down, some economists say. All other countries of the world would need to join in too. 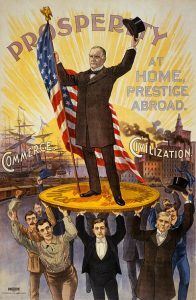 Many financial experts say a return to the gold standard could only work if other advanced nations did it too. Given the difficulty agreeing on trade issues alone, a global monetary agreement to the gold standard appears unlikely at current times. Gold is expected to continue to play a key monetary role in the future. While advanced industrial economies continue to degrade the value of their paper money by money printing and deficit spending, there has been discussion about an eventual "basket" of currencies that could someday become the new world reserve currency and replace the dollar. Gold would play a key part in that currency basket, financial experts say. While a return to the gold standard appears unlikely in our modern financial era. That in no way takes away the inherent power and value of owning physical gold. To the contrary, it only enhances the intrinsic value of gold – as an asset that can't be degraded by a government printing press. Gold is a traditional currency that is recognized as a store of value around the world. Why else would countries from the U.S. to Germany to Italy to China to Russia to Japan to India and dozens more hold hundreds of tons of gold in their central bank vaults? Owning gold is an appropriate investor for all investors. A properly diversified portfolio can include anywhere from 10 to 25% of gold, depending on your financial goals. If you haven't developed a financial investing plan, call Blanchard to get started with an individualized financial consultation. Blanchard has a long history of helping individual investors hedge their assets and grow their wealth. You can get started with investments as small as $380 for a 1/4 ounce American Eagle coin, all the way up to rare coins in the thousands. No matter your budget or your financial goals, we can help you too.